This standing hamstring stretch is easy post-run, since there’s no mat required. It also makes a nice transition from your cool-down heart rate to pre-exercise heart rate. Find anything stable about knee to hip-level high. Place your right foot up on the object. Your left knee should have a slight bend. Keep your hips squared forward. Lift your chest and hinge forward from your hips. Hold for 10-30 seconds, and then release. Next, lift your left foot up on the object. Lean forward, and then release. *Consult your physician before exercise. Stretching the front of your hips will feel good after sitting for a long period of time. You’ll also appreciate this stretch after a tough leg workout. 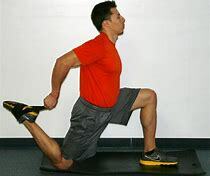 Begin by kneeling with your right knee on the floor, and your left foot forward and flat. Next tuck your pelvis under and lean forward with your hips 2-3 inches. For more of a stretch, place a strap around your right foot and lift up slightly. Hold for 10-30 seconds, and then release. Repeat the stretch kneeling on your left knee, with your right foot forward and flat. Sitting most of the day? Do this hamstring stretch to ease lower body and lower back tension. Lie down on the floor on your back. Extend your right leg straight up with your heel toward the ceiling. Place a strap or belt securely under the arch of your shoes to assist your stretch. Keep your shoulders and hips on the floor. Hold for 10 seconds, then release. Next, extend your left leg straight up toward the ceiling. Place the strap or belt securely under your arch. Hold for 10 seconds, then release. Ease muscle tension at the end of the day with this full body stretch. 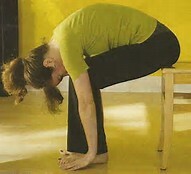 Begin seated on the floor with both legs out straight in front of you. Cross your right ankle over your left ankle and walk your hands forward, tuck your chin to your chest and bend forward from your low back. Hold for 2 to 3 deep breaths, then release. Next, cross your left ankle over your right ankle, walk your hands forward and ease into the stretch. Hold for 2 to 3 deep breaths, then release. 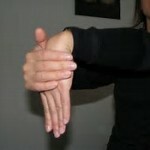 Extend your right arm forward with your palm facing down and your elbow straight. Curl your fingers down and in. Gently hold your right hand with your left hand if more comfortable. Hold for 10-30 seconds, then release. 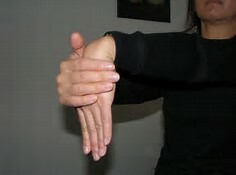 Next, extend your left arm forward and curl your fingers down and in. *Consult your physician before beginning exercise. If you’ve been sitting for hours without a break, ease lower body muscle tension with this seated stretch. Sit with both legs out straight in front of you. Sit up tall, bend from your hips and reach both hands toward your toes. Hold for 10-30 seconds, then release. For an extra stretch, drop your chin toward your chest. Begin standing straight facing a step, chair or railing. Lift up your right leg and place on object. Keeping your back straight, bend forward from your hips feeling a gentle stretch in the back of your right leg. Hold for 10-30 seconds, then release. Repeat the stretch with your left leg up. Bend forward slightly and hold for 10-30 seconds. Release. *This stretch is for those without injury or balance concerns. Begin seated with your feet flat. Inhale, and walk your hands down your legs to the floor. Exhale, and walk your hands back up your legs to return to your seated upright position. *Consult your physician before performing stretch. This stretch is not for those with injury concerns. Do this full body stretch daily to release muscle tension. Begin standing. Reach your right arm straight up overhead, gently lean to your left. Hold for 10-30 seconds or 3 full breaths, then release. Next, reach your left arm straight up overhead, lean to your right. Hold for 10-30 seconds or 3 full breaths, then release. Stretch your shoulders to alleviate upper body muscle tension. Extend your right arm straight up overhead, and then bend your elbow and place your hand behind your head. Next, reach your left hand down and around your body to your low back. Walk both hands toward the center of your back. Keep your torso upright and your shoulders down and back. Hold for 10-30 seconds, then release. Repeat the stretch with your left arm overhead, and your right arm by your low back. Hold for 10-30 seconds, then release. Never stretch into pain.